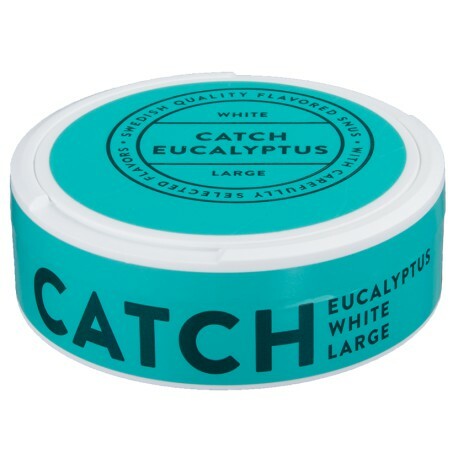 Catch White Eucalyptus snus has a dominate taste of eucalyptus and mint with an element of citrus. Eucalyptus snus is a favorite among snus-using koala bears and humans alike! Catch Snus is manufactured by Swedish Match; the world's largest maker of Swedish snus. This is a white portion snus meaning it does not go through an additional wetting process during manufacture. This makes the pouch drier to the touch and gives it a whitish color, hence the name white portion. No rocket science here! Swedish Match for the win! I enjoy the flavor and feel of these pouches quite a bit. For me, the flavor overall is more of what I would call menthol rather than mint as others describe. It is "minty" but to me the eucalyptus flavor is more recognizable than any specific mint. While the pouch was comfortable, I thought it started to drip rather quickly for a white pouch snus. I snus almost all day and I usually throw them out right after they start to drip, so I go through these way too quickly to be a reasonable everyday mint-substitute snus. Great for a change-up can every few weeks or so. Since I go through them too quickly if I'm outside the house, I like to keep the can in the refrigerator and enjoy the quick cold-blast along with the eucalyptus/menthol blast of these pouches- intense! The salt is way overpowering...maybe I got a salty batch, but it tastes like I'm gurgling ocean water. I can hardly taste the flavoring...I am used to tasting SwedishMatch's General Snus Mint and I like Ricola cough drops, so I know what it's supposed to taste like. It's painful to get past the salt, but once you do it has nice flavors. I got this in the grab bag. (Which i highly recommend) I wasn't sure about this, so i decided to try this first. I was surprised, this is a very tasty snus. I taste both mint and eucalyptus, but very light, not overpowering at all. I have a tendency to chain-snus and this is a great in-between snus to break things up. I recommend trying at least once especially if you like minty snus. This is a surprisingly tasty snus. I was a little worried that it would taste a bit medicinal. However it doesn't. A really nice variation on the typical mint flavor profile. I'll definately buy again. This snus is a good pick. It's far more minty than Eucalyptusey, but it's a fine snus. I tried this the 1st time tonight. The flavor is not hard and is very light. You can taste it but it is not a fake or over powering primary flavor. I will be ordering this again. You can feel a light tingle but it is not strong. This was my first swedish snus to try. It has a very subtle eucalyptus flavor. I wish it was a little stronger. But its not bad at all. Has a good tobacco flavor alongside the eucalyptus. Low nicotine. Overall i would still buy again. This is a very interesting snus. The eucalyptus is very evident, more so than the mint. I typically get this one in my bag o' snus order. However, I go through this pretty quickly. It's a good flavored snus and I actually like it a little more than the typical mint ones. I just can't use it all the time because it doesn't taste like tobacco. The only mint snus I'll use and IMO the only one that is done right. You can taste the eucalyptus in this one its not just a generic mint flavor. This is not bad snus its so so. I dont like it as much as others. Its very mellow and a good hit of salt. But with that i doubt i will buy it again. This is one of my favorite snus's. The flavor is mild and low tobacco flavor I came from smoking menthol cigs to snus This is the perfect Snus to go from smoking menthol to snus. This is one of the best of the flavored snus. The eucalyptus flavor is not at all overpowering. Rather minty, and doesn't burn like many mint snus do.